In his Essay Concerning Human Understanding, John Locke affirmed, "I do not question but that human knowledge, under the present circumstances of our beings and constitutions, may be carried much farther than it hitherto has been, if men would sincerely, and with freedom of mind, employ all that industry and labour of thought, in improving the means of discovering truth, which they do for the colouring or support of falsehood, to maintain a system, interest, or party, they are once engaged in." In Takings: Private Property and the Power of Eminent Domain, Richard Epstein, henceforth Professor Piestein, gave the quintessential demonstration of how to employ "all that industry and labour of thought... for the colouring or support of falsehood." In his "philosophical preliminary" chapter, "A Tale of Two Pies" Professor Piestein purported to illustrate, with a drawing of two pies, a Lockean perspective on "how natural rights over labor and property can be preserved in form and enhanced in value by the exercise of political power." The larger pie indicates the gains that are possible from political organization. 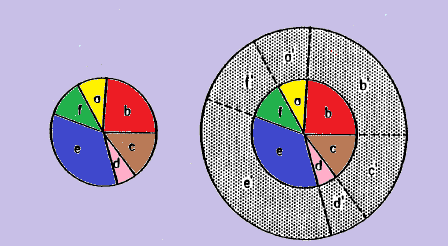 The outer ring represents the total social gains, while the dotted lines indicate the proportion of the gain received by each individual member. The implicit normative limit upon the use of political power is that it should preserve the relative entitlements among the members of the group, both in the formation of the social order and in its ongoing operation. All government action must he justified as moving a society from the smaller to the larger pie. Laws being made by others than the labourer, and being always intended to preserve the power of those who make them, their great and chief aim for many ages, was, and still is, to enable those who are not labourers to appropriate wealth to themselves. In other words, the great object of law and of government has been and is, to establish and protect a violation of that natural right of property they are described in theory as being intended to guarantee. What would Locke say? I'll not waste your time with a pile of extraneous exegesis and superfluous hermeneutics. Number VIII of Locke's Essays on the Law of Nature was titled, "Is Every Man's Own Interest the Basis of the Law of Nature? No." Number VIII was the source for several of the arguments in Chapter Five, "Of Property," in Locke's Second Treatise on Civil Government. What part of the word "no" did Professor Piestein not understand?